A kitchen remodel requires the employment of many specialty skills, and finding reputable contractors for each stage of the project can be time consuming and stressful. For homeowners in Gilbert, Arizona, and nearby areas, Premier Kitchen & Bath offers a solution. Since 1994, our company has provided true turnkey kitchen remodel services, handling kitchen makeovers from beginning to end. Our staff includes certified designers, experienced project managers, and skilled craftsman who have more than 150 years of collective design and remodeling experience. With Premier Kitchen & Bath, you can enjoy a beautifully designed and expertly constructed kitchen, without the hassle and stress of dealing with multiple contractors. 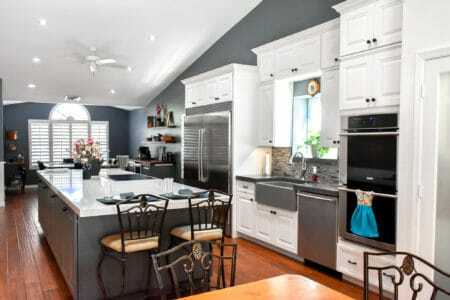 Our extensive set of construction skills means that we aren’t limited to just kitchen remodeling. In fact, Premier Kitchen & Bath can provide complete remodeling services for every room of your Gilbert, AZ, home. So, if you decide to expand your kitchen remodel to other home renovations, such as improving existing rooms, you won’t have to find another contractor. At Premier Kitchen & Bath, we’ve made the remodeling process painless and stress free so you can enjoy your dream home with one company and one contract, delivered on time. Contact us today to start your red carpet remodeling experience.